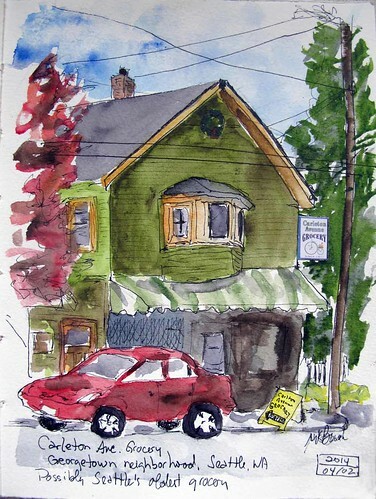 Urban Sketchers Seattle: Oldest grocery store? The Carleton Ave Grocery Store is one of the oldest in Seattle and one of only a few neighborhood corner stores left. I've been by several times and it seems to be a neighborhood hub. People stop by for a chat and sit outside on the bench when the weather is nice. It is far more than a convenience store as it stocks nutritious food and fresh vegetables. When the Urban Sketchers flickr group announced the weekly theme of "The most ___ house in your neighborhood" I thought I'd go over to sketch it as I've been meaning to for about a year. My neighborhood is boringly monoculture and bland, so I have to go somewhere else for interesting houses.